Moggill Cemetery is located on Moggill Road, Bellbowrie in Brisbane - a track leads from the road through the bush to the cemetery. It opened in 1865 and is now classified as an Historic Cemetery. 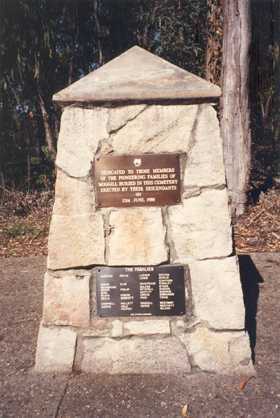 A stone cairn commemorates pioneer families of Moggill. This transcription was completed in November 1995 and is a terific genealogy tool for anyone exploring their family history or building a family tree.